The Queen Hates the Word "Pregnant" and Would Refer to Meghan Markle as "In The Family Way"
Why You'll Never Hear the Queen Refer to Meghan Markle as "Pregnant"
Don't mention the P-word to Her Majesty. There’s a lot of complicated rules and regulations to remember if you ever happen to become a member of the royal family (keep going, chase your dreams), but this latest revelation about the preferences of Queen Elizabeth II herself is probably worth noting. Mainly because it is truly hilarious. Like you didn’t already know, but Duchess of Sussex Meghan Markle is currently a few months pregnant with her first child, and she and husband Prince Harry could not be happier about the wonderful news. But I’ve already made a major faux-pas on the matter as far as royal protocol goes because, according to the Queen, the word “pregnant” should absolutely never be used to describe a woman who’s expecting a child. A resurfaced, old article, written by Us Weekly all about the Queen’s rumored pet peeves, has revealed that Her Majesty simply hates anybody using the P-word, and finds it to be entirely “vulgar," according to a palace source. Wow, I am actually such a commoner. Meghan Markle is in the family way, and don't you forget it. 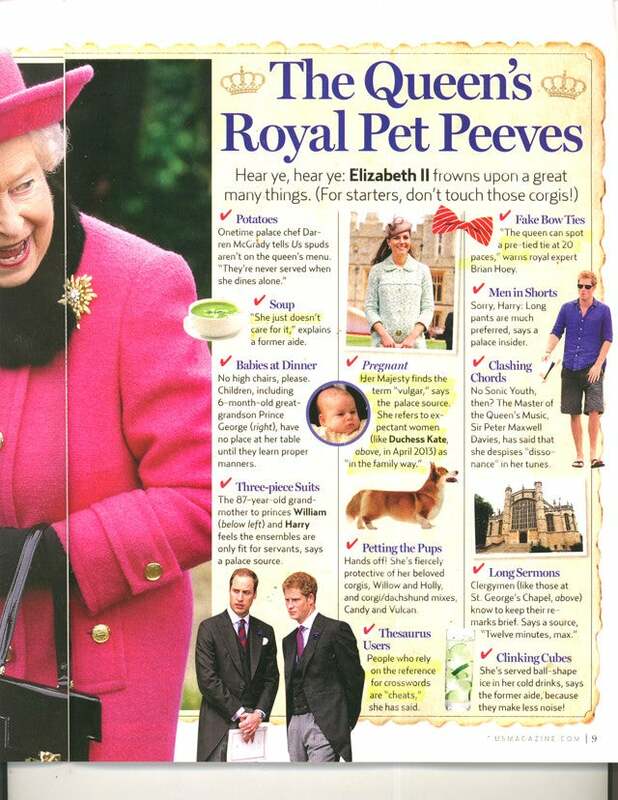 Amongst the rest of Her Majesty’s pet peeves, you’ll apparently find potatoes (this is truly sacrilege), soup, babies at dinner, three piece suits, any petting of her corgis (rest in peace, good boys), men in shorts, fake bow ties, and the unthinkable—clinking ice cubes. One simply cannot tolerate clinking ice cubes.